Huwi bears, I love your bear! To me he looks like he is saying "Ilove you". No need for that :redface: Corinne; I think he's is just lovely! I'd be happy if I could make a bear like that. This is Romeo, my first bear. I made it on a pattern that my dear canadian friend Tiffany got from a book (don't know which book really) and she taught me how to make a teddy bear step by step, private teddy bear lessons, when she was visiting in 2004! She also gave me the materials...in Italy it's near impossible to find bear making supplies. Then I got hooked, and started using the internet for my bear shopping. Now I don't use other people's patterns, I draw my own, and that is really fun! I've never sold a bear. I've made about 25 bears in the first two years of teddy bear making. I've given many as presents to people I love. The first five or six were out of patterns, some from the same but with different fur, noses etc, and it was very interesting that with the same pattern many different bears could be born, like with the same parents you never have the same children...except for twins! 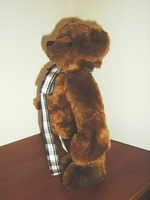 Then I started wanting to make my own bears, and I tried to modify the patterns to get different things and shapes. That was fun and hard. I always worked in total isolation, I mean that I had no fellow bearmakers to share my thoughts etc. well, sorry, this message is maybe too long...my fault, I like to talk! now I go back to my current project, when she is finished I'll share a picture in the gallery. Romeo is a lovely bear, Francy. He looks like he's ready for anything - playtime, hugs, you name it! I know what you mean about how the internet can really make you feel connected. This site is wonderful and has made me feel, that there is others, in our world that, feel about bear the way we do. I have also learned so much here and want to thank all the people that do not mind sharing what they know. I really enjoy seeing other peoples bears and other animals. Finally worked out how to post pics, here's my first bear: Noah. He's 5" tall standing from another artist's pattern. He's the only bear I've ever made from another's pattern. I now design all my own. Awww I'm loving this thread...... I'm just about to embark on my first bear ever!! ...... seeing all your first bears has given me lots of confidence!! Judi, You made your FIRST bear in real fur!!!??? Now that's what I call class, and brave! He must have been pretty good if someone bought him. My first bear is my avatar. He's not bad but as my teacher used to say 'could do better'. 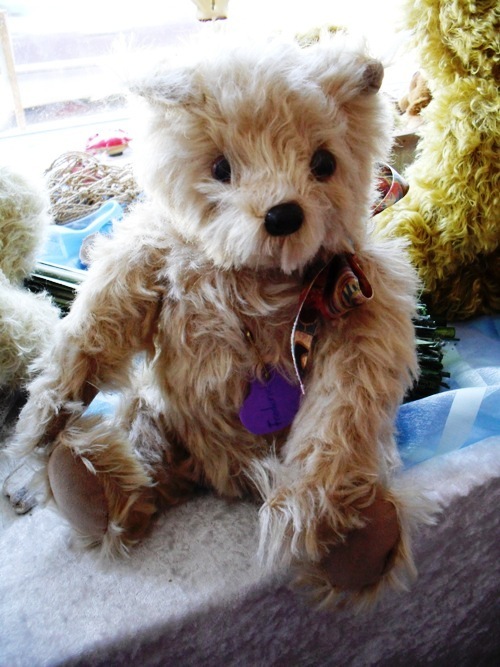 I love the bear in your avatar Frances he's gorgeous! Your bears are amazing you should be proud of your self. My first bear , now it it so funny. Those eyes, Alena! It is a funny bear, but also full of personality and creativity. I hope you'll always keep it.